DON'T SPEND HOURS AND HOURS DOING THIS! No more ironing standing up! Standing for hours at an ironing board is so old fashioned and so unnecessary! The Fastpress is the modern easy and very fast answer. Thousands of happy Fastpress users have literally changed their lives with this fabulous machine that is simplicity itself to use. FREE DELIVERY ON ALL WEB ORDERS! So simple to use on everything from trousers to shirts or blouses, FastPress will zip through any garment in half the time. Saves time and effort. Simply close the press with fingertip control, the pressure is automatic, the effect stunning. Leave your FastPress closed and the electronic alarm sounds after 30 seconds and the power is automatically cut off. 28 Day Money Back Guarantee - For Your Total Peace of Mind! ONE OF THE MOST ADVANCED IRONING PRESSES YOU CAN BUY.  FASTPRESS has been carefully designed and extensively tested to ensure maximum results from minimum user effort.  FASTPRESS uses very little energy, about the same as your existing iron.  One thing that won't get hot with FASTPRESS is you because it's so simple to use and produces such a beautiful finish!  FASTPRESS is quick to set up on any table or any work surface, light and easy to carry around and takes up very little storage space. 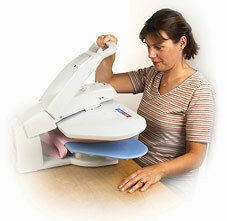  The easy to use FASTPRESS features fingertip closing and simple, clear controls. 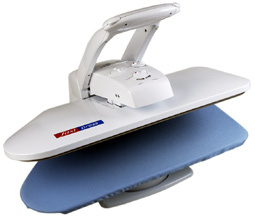 The non-steam version will give you excellent ironing results and has the advantage of the heating plate being made of a special alloy called Supertherm which transmits the heat without reflecting it. This means as a user you are cooler. Also the non-steam version will probably have a longer life and less maintenance as there is no steam boiler. The finish is achieved by damping down with the spray bottle provided and the pressure of the press. This press is suitable for light commercial use as well as domestic use. The new Fastpress Steam has a pressure steam system and has a Teflon coated heating plate which is somewhat hotter for the user than the non-steam version. The steam is very effective where an occasional shot of steam is required for creases in trousers etc. and should not be compared to the continuous flow of a steam iron. For extremely dry clothing an extra damping down with the spray bottle is recommended. This is an excellent press providing steam is used as an aid rather than for continuous use, and distilled water is used for the steam boiler. It may require more long-term maintenance and have a slightly shorter lifespan than the non-steam version due to the presence of water. The steam version of the Fastpress is not suitable for commercial use. 80% of our sales are the non-steam version and this is the one we recommend for the reasons stated above. If you want any further advice please ring the Sales office. Don't forget, whichever version you choose, the best ironing results are from laundry which is not bone dry.